Relationship revenue must be your focus. If you are an entrepreneur, business leader, sales professional, attorney or any type of professional service provider, the only way you can grow with reduced personal labor intensity is through leverage. That means relationship revenue is a must. 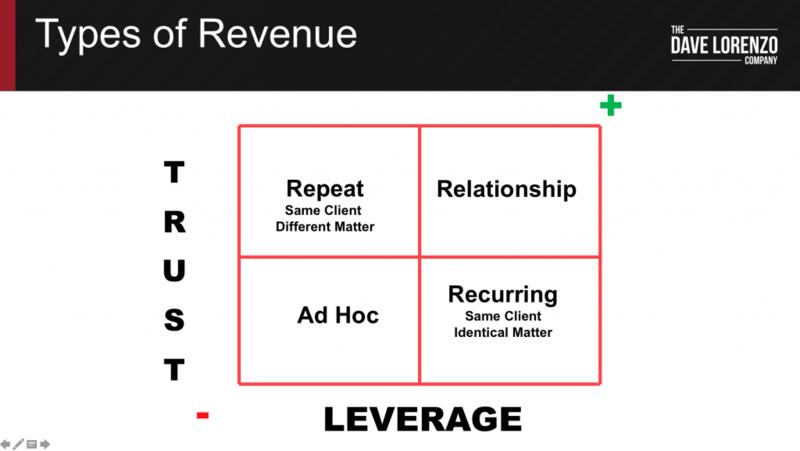 This video explains what relationship revenue is and why you need to focus on it right now. Today we’re going to talk about four different types of revenue that you experience every day. This concept was originally introduced in my book titled The 60 Second Sale. Some of these types of revenue are going to be more valuable to you than others, and I bet you haven’t given this any thought. 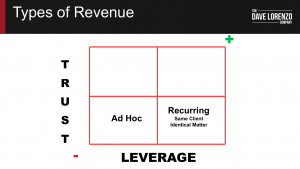 The first type of revenue I want you to think about is ad hoc revenue. You go out, you find a client, you sell something to that client, and you move on, and you look for another client; and this repeats itself over and over again. Every sales professional I know is out there right now chasing the next new client, selling widgets to that client. Every professional I know is out there trying to find that client that they can help and then they’re moving on to try and find another client they can help. When it comes to ad hoc revenue, I want you to think about a couple of things. You need to get that client to invest their trust in you. That’s what clients do, they invest money but they also invest trust in you before they invest their money, and that’s a high hurdle. You have to develop a relationship and make sure that relationship is on solid ground, and once it is, you can ask the client to trust you and then they give you their money after they give you their trust. As a businessperson, or for you as a professional, working on a matter means you can’t go out and sell to somebody else. You, doing your business, doing your job, servicing a client means you can’t sell during the time that you’re servicing. Ad hoc revenue makes it really difficult for you to grow your business. It makes it extremely difficult. You need to employ leverage. 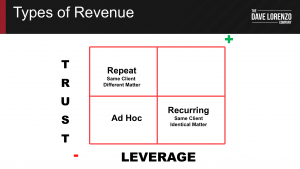 In order to do that you go after what’s called recurring revenue. On this little chart here, you’ll see the X axis is leverage, which also includes ease of acquisition, and the Y axis is the amount of trust that’s required for someone to invest in you before doing business with you. Ad hoc revenue is a threshold. It is usually a gateway to a new relationship. The client must invest some trust in you but they trust you to do something that is really basic and then you can build up more trust over time. With recurring revenue, they’ve seen you handle this type of business before. They know you’re capable of doing it, so the client gives you their business over and over and over again. Maybe it’s the same client, maybe it’s a different client. You become known for doing a certain thing over and over and over again. For example, I just got a cooler from the Yeti, Y-E-T-I. Their coolers are amazing. I got a cooler as a gift. It was a big cooler, it’s a giant cooler, and I needed a little cooler to take with me to one of my kids’ games. I love my Yeti cooler so much that I went out and got a little one. Yeti has cornered the cooler market. Their recurring revenue comes from selling coolers to people over and over and over again. Same thing over and over and over again. This can be recurring in that it’s the same product or the same service over and over again. What are they doing? They’re employing leverage. They make a bazillion of these coolers and people buy them over and over again. In the service business, if you’re a lawyer, for example, and you do evictions in a landlord/tenant sense, you can do evictions over and over again. That’s recurring revenue. The amount of trust the client needs to invest in you doesn’t have to increase ’cause they’ve seen you do one eviction, they know you’re really good at it. You can do this over and over again. You become known for doing evictions and you employ leverage because you have systems and it’s formulaic. Recurring revenue allows you to employ leverage and work less but still make more money. That’s good but it’s not great. Let’s talk about repeat revenue. Take a look up on the X axis, you’ll see repeat revenue up there. That means that a client has invested more trust in you because it’s the same client but a different type of work. Or, it’s the same client but a different product, so the client trusts you. If Yeti made footballs, and I trusted them with coolers and I knew they developed a quality cooler, and I wanted to go get a football, I would trust them to buy a football from them. That’s repeat revenue. In the professional services setting, if I trust you to do my eviction work, and now I need somebody to draw up condominium documents for me becuase I’m converting one of my development properties into a condominium, that’s a different type of work. I need to invest more trust in the fact that you will do this work for me and you’ll do it well. Once I invest that trust, I still need you to do the work. Your leverage use isn’t that high. It isn’t high enough. The trust is there but the leverage isn’t there. We want the best of both worlds, and that’s called relationship revenue. You’ll see here on the graph relationship revenue is high leverage and high trust. This is high leverage in two ways. The high leverage is that the relationship revenue comes to you without you making any effort, that’s called ease of acquisition. It’s very easy for you to acquire. I didn’t do anything to go out and acquire that client. I didn’t do anything to go out and acquire that business. It came to me because of my relationship with the other person. Here’s the second part of that; because I have someone on my team who can deliver the service, I don’t even have to do the work. The business comes to me from somebody else, and then I have a person on my team do the work, I don’t even have to do the work myself. That’s employing leverage. 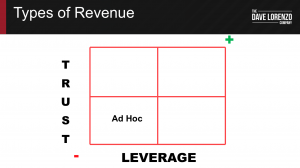 High leverage and high trust, that is significant relationship revenue. Why do I talk about this all the time? Because that’s what we’re looking to develop. Our goal in our work together, is not for you to get more ad hoc clients. You will as a result of the work we’re doing, but it’s not for you to get more repeat or recurring business. You will as a result of the work we’re doing but that’s a byproduct. Our goal is for you to attract more relationship revenue. We’re going to deepen the relationships you have. We’re going to reactivate some older relationships with people who may have forgotten about you or forgotten about what you do. We’re going to create new relationships and then deepen them so those people show up and they drop a bag of cash right on your desk in the way of new work that you hadn’t even thought about attracting. Then you’re going to have to develop relationships, either with members of your team or with referral sources, or with people inside your organization so that they can do the work for you. You can move on and develop more relationships, deepen more relationships, and keep the cycle going. Your goal is to focus on developing relationship revenue all the time. I don’t want you to think about ad hoc matters. I do not want you to think about one off work. I want you to think about developing relationship revenue all the time. That’s your focus, that’s your goal. Now that you know what relationship revenue is, I want you to leave me a comment or write me an email about what you’re going to do to develop more relationship revenue in your business. Because that’s our goal, to have people come in and drop a big old bag of cash right on your desk. If you’d like to read more about this concept you can find a detailed explanation on page 9 of my book titled The 60 Second Sale: The Ultimate System for Building Lifelong Client Relationship in the Blink of an Eye.